D. PERCEPTION OF THE WAY TO PROGRESS: the Eight-Point- Programme for Future Investment and Strategy Planning. 8. CLIMATIC CHANGES AND CHANGES IN THE GEO-STRUCTURE. In many countries poverty, injustice and want are still common. Exploitation of nature and human resources endanger the life and culture on our planet. Valuable resources are wasted permanently. The ecological disequilibria and dismantling of the foundations of life accelerate. 4. ‘HEAVEN’ (Deserts and Winds). It could be shown that we are dealing here with a comprehensive, cybernetic system, perhaps similar to some of the theories developed by Talcott Parsons and others. This is principally the same objective goal, which all great philosophers and religious men have taught. It stipulates that all life has a meaning and a purpose. The key to success in our work, in relation to our fellow-beings, in our relation to nature, the environment, etc. is to be found in our attitude. 1. WORLDWIDE ERADICATION OF BELOW-POVERTY CONDITIONS THROUGH DISTRIBUTION OF LAND, WEALTH, TECHNOLOGY AND POWER; INTERNATIONAL LEGISLATION FOR BIRTH CONTROL, EQUALITY OF MEN AND WOMEN, RACIAL EQUALITY AND EQUALITY OF CHANCES. 2. CULTIVATION OF OCEAN RESOURCES AND EXPLORATION OF OCEAN FLOOR DEPOSITS; CREATION OF A COMMON WORLD CURRENCY. 3. ESTABLISHMENT OF WORLD FEDERAL ADMINISTRATIVE CENTRES, A UNITED NATIONS PARLIAMENTARY ASSEMBLY AND A BINDING INTERNATIONAL COURT OF LAW. 4. RESEARCH IN AND UTILIZATION OF NATURAL ENERGY RESOURCES SUCH AS SOLAR ENERGY, BIOMASS, TIDAL, GEOTHERMAL AND WIND POWER; EXTENSION OF THE PUBLIC TRANSPORT SYSTEM. 5. REFORESTATION AND PROPAGATION OF WILD LIFE; TRIBAL REHABILITATION BY RETURNING THEIR NATURAL HABITAT INTO THEIR POSSESSION. 6. IMPROVEMENT AND COORDINATION OF HEALTH SERVICES, EDUCATION IN PREVENTIVE MEDICINE, HEALTH FOOD AND NATURAL LIVING; RETURN TO BIODYNAMIC FARMING AND NON-POLLUTING PEST-CONTROL METHODS. 7. RECLAIMING OF DESERT LAND WITH THE HELP OF SCIENCE, TECHNOLOGY, LABOUR, FORMER SOLDIERS AND DEVELOPMENT AGENCIES; IMPLEMENTATION OF AN INTER-ASIAN IRRIGATION AND CANAL PROJECT AND A TRANSPOLAR ELECTRIC POWER GRID. 8. ESTABLISHMENT OF ‘FOREST ACADEMIES’ AND DESERT PROJECTS AS FREE INTERNATIONAL UNIVERSITIES AND CENTRES FOR RESEARCH AND DEVELOPMENT; EXTENSION AND COORDINATION OF AN INTERNATIONAL COMMUNICATIONS NETWORK. It was Willy Brandt, former West‑German Chancellor, Chairman of the Independent Commission on International Development Issues (IClDI) and President of the Socialist International, who had repeatedly pointed out that “development aid has become a new dimension of peace policy”. However, if we are to build the World of Tomorrow, where our children can live and work in peace, it is necessary to adopt a programs of action, constructive economic plans, that will move the people, politicians and academics, and to which all peoples and nations can contribute, and in which they can participate. Such a project has been envisaged for the Indian subcontinent. Implementation of the project could call for global collaboration, planetary planning and a transnational investment policy. 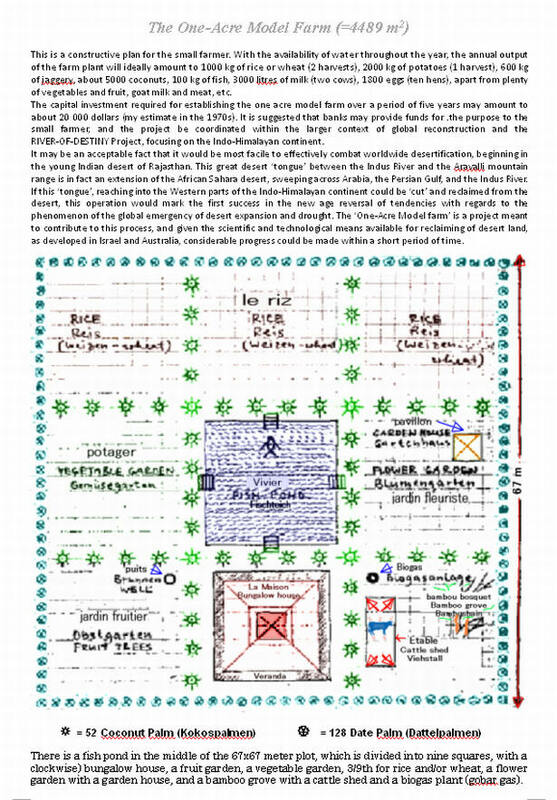 The River of Destiny Project for World Unification as a strategy could raise public consciousness. Individuals, organisations, governments, and the United Nations could collaborate in the scheme. The River of Destiny Project is only a beginning. Its cost had in 1971 been estimated at 4 billion dollars. Other projects could follow or be simultaneously implemented, such as the Sinkiang Base Project or connecting night and day in a single intercontinental power grid coordinating the electrical generating capacity of Russia, China and the Americas. The Indian Subcontinent, comprising in its ultra‑maximum circumference central and South India, the Indus‑Ganga‑Brahmaputra plains and the great Himalayas, Baluchistan, the Hindukush and Pamir mountain ranges, the Takla Makan desert bordered by the Tien Shan mountains in the north and the Kunlun Mountains in the South, Tibet and Burma, is of unique ecological importance for the whole planet. Traditionally India has been called the ‘Cradle of Culture’, Dharma Kumbha, the ‘Motherland’, Matribhumi, the ‘Root Country’, Mulabhumi, the ‘Original Paradise’, Nandankanon and the ‘Land of Action’, Karmabhumi. Sri Aurobindo, one of the great spiritual leaders of modern India, called her ‘The Heart of the Orient’. India is as distant from Japan as it is from Italy and Greece. China in the East is as far as Mesopotamia in the West. There is historical evidence that the people of the Indus Valley Civilization of Mohenjodaro and Harappa traded with Egypt. Trade links of equal antiquity, dating back to about 3000 B.C., probably existed between India, China and the Malayo-Polynesians. Both the inhabitants of the Indus Valley and the inhabitants of Bengal were famous for their skill in navigation. Almost surrounded by water, with the Arabian Sea in the West, the Bay of Bengal in the East and the Indian Ocean in the South, India’s position is ideal for development of fishing industries, cultivation of ocean resources and marine trade. Arnold Toynbee maintained: ‘Indians were the first marines to establish trade with the world’. Throughout the history of the world, this, India has been known for her culture and wealth. Although its population density is not much different from that of Europe, China and the American West coast, the Indian continent has the advantage that its land can be cultivated throughout the year. Under favourable conditions rice can be harvested three times a year. There is practically no piece of land that cannot produce some crop or other at least once a year. With the availability of water everywhere throughout the year, the subcontinent could become the ‘food basket’ of the world: it is the cradle of agriculture even today, its variety of raw materials and natural resources which are exported is astounding. Cashew nuts, coconuts, peanuts, oils, fish, meat, tea, coffee, jute, spices, sugar, rubber, cotton, alcohol, long corn rice, silk and pearls, as well as iron ore, graphite, manganese, copper, mica and bauxite are exported to earn foreign exchange for purchasing technological know‑how and machinery to help develop and establish the country’s industry and technological and economical independence in order to be able to compete with other countries in the international market. With nearly 1/6th of the world’s population modern India is a fast developing economy, promising a bright future. It is the largest democracy, and its Muslim population is a factor to be reckoned with as a political and economic determinator. According to Dr. K. L. Rao, a former Indian Union Minister for Irrigation, drought areas in India today are located in four regions: the drought region in the Ganges basin itself, a few districts of Orissa and West Bengal, Rajasthan and Gujarat regions which account for one third of the country’s arid area, and the peninsular area below the river Tapti in Maharashtra. With its 14 major rivers, 44 medium rivers and numerous minor rivers, India’s biggest water resources are located in the Ganga and Brahmaputra basins, each yielding about 500 million cubic metres annually. The total annual average quantity of water in the river systems and the exploitable underground sources is 1900 million cubic metres. According to Dr. Rao again, the most important link would be that of the Ganga and Cauvery, linking enroute the Sone, Narmada, the Tapti, Godavari, Krishna and Pennar. The Ganga-Cauvery link involves lifting of the waters of the Ganges to a height of 300/400 metres by constructing a barrage near Patna, to serve the drought areas of U.P. and Bihar. In addition, water will be pumped from the central plateau of India to the dry areas of Rajasthan, Gujarat, Madhya Pradesh and Maharashtra. A barrage of Dhubhri on the Brahmaputra and a 300 km canal will help divert surplus waters of the Brahmaputra to the Ganges, benefiting Bangla Desh also. Water from Navagam on the Narmada in Gujarat could be fed to Hutch and the Luni basis in western Rajasthan. Surplus flood waters of the Narmada could be fed into the system at this point, lowering the draw from the Ganges. Another link would help utilise the waters of the Chambal across the Aravalli mountain ranges in Ajmir and central Rajasthan. Another link to be considered is of the rivers of the western ghats for serving the rain shadow areas in the eastern part of the subcontinent, canalizing wasteful monsoon season flow; Mahanadi shall have to be linked to serve drought areas up to Vamsadhara. Apart from Irrigation, canalisation may also be used for navigation and the generation of hydroelectric energy. As to the navigation, it is clear that a national water grid over and across the length and breadth of India, will greatly enhance transport facilities ill the country. Perhaps even more important, the problem of floods can also be solved by river linking. The power potential of the Ganga basin in the Himalayas is estimated at 10,000 megawatts, and extensive tunnels and dams are being built for the generation hydroelectric energy to feed a state-wide grid. However, decentralized power-generating units under village supervision would be more appropriate to meet ecological concerns today. A project of this magnitude perhaps cannot be implemented and carried out without international cooperation. The Indian subcontinent is ideally suited, as we have seen, to fulfil the conditions for implementation of a constructive plan of action that would involve all peoples and nations on all levels. See Max WEBER, Collected Essays on the Sociology of Religion, Tubingen 1920, p. 203, warning expressly of the moloch of the “modern economic order, tied to technical and economic conditions of mechanical machinized production... which determine the lifestyle of every single person who is born into this machinery ... with overwhelming compulsion, until the last barrel of fossil fuel has been burned away.” Translation following Talcott PARSONS (transl. ), The Protestant Ethic and the Spirit of Capitalism, New York, Charles Scribner’s 1958, p. 181. In this rubric I have variously placed the ‘River-of-Destiny Project’ (see APPENDIX I. ), or democratic, federal world government. The smallest workable ‘unit’ in the ‘River-of-Destiny Project’ is the ‘One-Acre Model Farm’ (see APPENDIX II.). In January 1979 a ‘Project for World Unification, Peace and Progress through Cooperation’ was adopted by an assembly of concerned global citizens at the World Constitution and Parliament Association’s Third Session of the World Constituent’s Assembly. The ‘River-of-Destiny Project’, as it was also called, represents a PERCEPTION of what the GOALS might be, if one would work to achieve A GLOBAL SOCIETY ENJOYING FREEDOM, PROSPERITY AND PEACE. See APPENDICE. The `River-of-Destiny Project was presented to the Third Session of the World Constituent Assembly, convened by the WORLD CONSTITUTION AND PARLIAMENT ASSOCIATION (WCPA), at Colombo, Sri Lanka (29 December 1978 to 6 January 1979). The work was the outcome of a group of 13, i.e. the Strategy Commission. The Commission was chaired by Mrs. Helen Tucker from Canada, who also suggested the title ‘River-of-Destiniy Project for World Unification, Peace and Progress through Cooperation’. Both a ‘Report’ and the paper itself were published in WORLD UNION, ‘focus’, vol.XVX, no.7 (July 1979), pp. 37-45. R.B. FULLER in a forward to Dinshaw J. Dastur, This or else..., Bombay: Jaico Publishing House, 1976. A project of reforestation and development in the Sinkiang Autonomous Region of the Peoples’ Republic of China.